Each year, for the past five years, I have reviewed all the job ads appearing in the Australian Financial Review (AFR), on the last Friday in October. I do this with the purpose of categorising each ad into one of four quality ratings (see below) and tracking what progress has been made (if any) in overall ad writing quality. There is no panel or independent arbitrator here, just my very personal opinion about the quality of each ad. The total quantity of job ads has continued its decline with a 35% fall in the total number of ads compared to 2010 (24 v 37). No wonder Fairfax Media shares continue their death spiral. The split of ads between agency (10) and direct-employer (14) continues the decline in market share in AFR ad space by agencies (63% in 2007, 54% in 2008 and now 42% in 2011). The percentage of ads I classified as ‘poor to awful’ declined back to its 2009 levels after climbing to 19% last year . After five consecutive years of this assessment exercise and reviewing a total of 244 ads, there has still only been this one ad that I have rated as outstanding (written by Melbourne recruiter, Tom Key in 2008). This ASIO ad took up 75% of page 7 and wasted two thirds of that space with a meaningless graphic. The closest I got to awarding ‘outstanding’ to any of the ads was the Gerard Daniels ad on behalf of their client, the West Australian Football Commission for a new CEO. 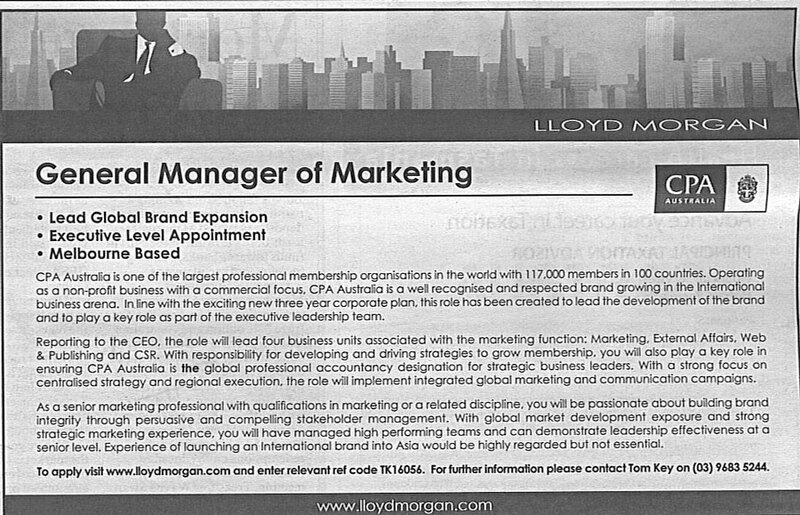 The aspect of the ad that held it back was the bullet point stating ‘Creating a new direction for the WA Football Community’ followed by part of the copy that read ‘This position requires an inspirational leader who can create a new paradigm ….’. Having made these two statements, there was then no attempt at explaining what this new direction or paradigm was. As I said last year, and it equally applies this year, recruitment advertising isn’t rocket science. It’s an easy skill to learn yet most people who write recruitment ads still appear to be content to pump out content that is, shall we say, workmanlike, rather than inspired. When I see recruitment ad writers utilising info-graphics like this Belgium change and innovation consultancy does, it’s clear that the end of traditional print media job advertising is not far off. After five years of shaking the ‘ad writing tree’ I think I’ve said all I need to say on this topic. I doubt I’ll do the same exercise again next year. If you check out my previous posts on this topic, I think you will understand why.